Though the controversial proposal to build a 4,000-mile network of highways and rail lines across Texas never came to fruition, the Trans-Texas Corridor proposal helped usher a change in how the state builds roads. A series on the growth of toll roads and lanes around the state. Nearly 11 years ago, Gov. Rick Perry offered a vision for Texas that was covered in toll roads. At a news conference in Austin, Perry delivered the first of hundreds of pitches for the Trans-Texas Corridor, a 4,000-mile network of privately operated toll roads, railroad tracks and utility lines that would stretch across the state. The projected timeline for the project: roughly 50 years. The price tag: $175 billion. With just a year as governor under his belt, Perry proposed the most expensive transportation project in the country. As originally planned, it could have redirected national trade routes, sparked development across rural Texas and provided a big boost to public transit. Though it ultimately collapsed under the weight of public opinion, the project upended the state’s transportation politics and policy, the effects of which still linger a decade later. Prompted by Perry’s proposal, the building of toll roads evolved from a largely civic concern into a hot-button political debate. And despite periodic outcries, tolling roads and lanes have evolved into a fundamental part of the Texas approach to transportation as public financing has trailed far behind the state’s needs. Perry framed the Trans-Texas Corridor as tackling several problems facing the state in one sweeping endeavor: cutting traffic congestion around fast-growing cities, curbing the air pollution from the vehicles stuck in that traffic and rerouting the transport of hazardous materials away from crowded communities. “None of these problems will be solved if we keep expanding our state transportation system the same way on top of the same congested corridors,” Perry said. The Legislature passed a bill in 2003 allowing the project to move forward, even as opposition began to mount from environmentalists, property rights advocates, farmers and business leaders. The emergence of Spain-based firm Cintra as a key player in the corridor’s initial construction prompted separate concerns that a foreign entity was gaining control of the state’s transportation system. Promoting and defending the project alongside Perry was Ric Williamson, a longtime friend of the governor and member of the Texas Transportation Commission. The pair soon found themselves the target of political signs, blog posts and petitions, all claiming that their ambitious plan was an attack on private property rights and state sovereignty. Susan Garry still recalls the moment she saw a master plan for the corridor that cut through her farm in Coupland. Texans with little or no history of political activism found themselves drawn into the debate. Many feared the plan would sever school districts and public bus routes. Farmers worried about moving livestock and equipment if the 1,000-foot-wide corridor cut through their land. While none of Ralph Snyder's Bell County farms were threatened by the corridor plan, he believed the project was a threat to the “way of life” of many Texas communities. He became active in groups that harnessed the internet to rally Texans against the project and pressure lawmakers to publicly renounce it. The growing opposition eventually awoke partisan leaders to the emergence of toll roads as a political issue. In 2002, neither the Republican nor Democratic Party in Texas mentioned toll roads in its party platform. Two years later, the Texas Republican Party approved a repeal of the Trans-Texas Corridor’s enabling legislation in its platform. In 2006, Democrats began calling for a statewide ban on toll road construction. Yet the list of lawmakers on record against the project continued to grow. By 2011, the Legislature had erased every mention of the Trans-Texas Corridor from Texas statute and nearly every word of the original legislation authorizing the project. Deirdre Delisi, a former Texas transportation commissioner and Perry chief of staff, argued during a panel discussion on road funding at The Texas Tribune Festival in September that Perry never got proper credit for steering a statewide conversation of the state’s long-term transportation needs, an issue no Texas politician had seriously broached in decades. While Perry’s original vision may be dead, his push for the plan allowed for TxDOT to expand its stake in toll roads and set the stage for projects arranged as public-private partnerships. Texas has $20 billion in roadwork under way through public-private partnerships, according to Ted Houghton, chairman of the Texas Transportation Commission. TxDOT plans to ask the Legislature for the authority to move ahead with more such projects next year. The alternative is letting projects remain in limbo for years due to a lack of funding, he said. “I think it’s the way the country operates and especially for Texas because the growth here is so phenomenal,” Houghton said. Cintra has contracts for three road projects in Texas, constituting about $5 billion in private investment against about $1 billion in public subsidies, said Nicolas Rubio, president of Cintra’s American arm, based in Austin. He described the state as a pioneer in employing public-private partnerships, also known as P3s. In October, Perry and Rafael del Pino, chairman of Ferrovial, Cintra’s parent company, were among those in attendance for the grand opening of a 41-mile stretch of State Highway 130 between Austin and Seguin. It is the first privately developed and operating toll road in Texas. The state owns the land and the road, but a private consortium led by Cintra built it and will operate it for 50 years. The toll revenue will be divided between TxDOT and the private consortium. Along with the approach to financing the project, the toll road’s 85 mph speed limit, the fastest in the country, also has roots in Perry’s corridor plan. State lawmakers first opened the door to such high speeds as part of its original legislation authorizing the Trans-Texas Corridor in 2003. The higher speed limit was the only provision of that original bill that wasn’t removed from the transportation code later on. This story is the last in a four-part series on the growth of toll roads and lanes around the state. To view Part 1, an interactive map of toll projects around the state, click here. 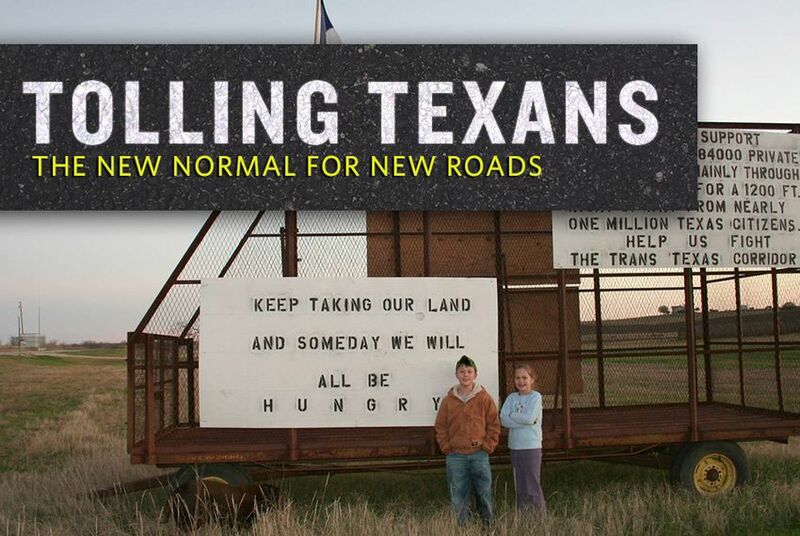 To view Part 2, a story looking at why Texas finds itself resorting to tolling so often to build new road projects, click here. To view Part 3, which examines why toll lane projects are poised to spread across the state in the coming years, click here.